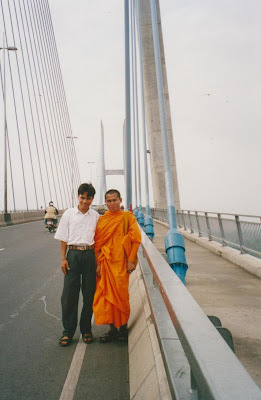 Back in the late 90s I began to hear from my friends in Vietnam about an amazing new bridge that was being built to span the Mekong between (I think) My Tho and Vinh Long (or close enough). All of the Vietnamese that I spoke to were in genuine awe of the project - the first of its kind. Crossing the Mekong by ferry between major cities and provinces is a particularly gruelling experience, and in recent years there had been a number of deaths caused by over-full cars and buses plunging into the river from the ferry or the jetty. The bridge was viewed with genuine gratitude by the Vietnamese people, and was responsible for a tremendous amount of good will being built up between Australia and Vietnam. 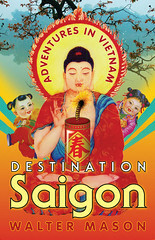 When it was opened I was invited to visit Can Tho by some Khmer friends in Saigon. We hired a car, and everyone was very excited to be crossing over the bridge for the first time. There were signs all over the bridge warning vehicles not to stop at any point. Exactly halfway across, my monk friend Son Thua ordered the driver to stop so that we could all get out and take a photograph. The driver was hesitant, but he didn't dare disobey. And so we got out and stood in an outer lane, traffic whizzing by us dangerously, and took some snaps to commemorate this special bridge and our special trip. Laky, on the left, had only just left the monastery. The monk Son Thua these days lives in Burma, where he has mastered English and become something of a meditation master. I am still in touch with both.